DEAR MAYO CLINIC: I'm a 49-year-old woman, and I’ve played tennis for many years without any injuries. But a few weeks ago, I developed pain in my shoulder during a match and was diagnosed with a rotator cuff tear. My doctor recommended rest and ice. That doesn't seem to be helping much, and the pain is keeping me awake at night. What other treatment is available? Is surgery an option? ANSWER: Your situation is common. 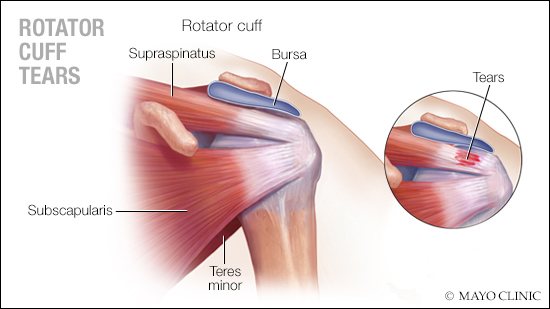 Rotator cuff tears happen frequently as people get older, particularly in individuals who engage in activities that require repetitive arm motions. Conservative therapies, such as rest, ice and over-the-counter medications, usually are the first step in treatment. When that’s not enough, physical therapy and steroid injections can be useful. Surgery typically is reserved for tears that don’t respond to other treatments. Your rotator cuff is the group of muscles and tendons that surround the shoulder joint. The rotator cuff keeps the head of your upper arm bone properly positioned within the socket of your shoulder. Because it’s a shallow ball-and-socket joint, your shoulder has a much wider range of motion than many other joints. But along with that range of motion comes more susceptibility to injuries. Rotator cuff tears are among the most common shoulder injuries. They happen when a rotator cuff tendon is separated, either partially or completely, from the bone. As you age, the risk of rotator cuff tears increases. That’s because rotator cuff tendons have a tendency to fray over time, making them even more vulnerable to damage. In people who regularly use repetitive arm motions — such as painters, carpenters, and baseball and tennis players — the risk is even higher. When a rotator cuff tear is minor, taking a break from activities; applying ice regularly; and taking a nonprescription anti-inflammatory medication, such as ibuprofen or naproxen sodium, may be all you need to relieve the discomfort. In many cases, physical therapy also may help. A physical therapist can teach you exercises targeted to the location of your rotator cuff tear that can help restore strength and flexibility to your shoulder. If pain persists despite those steps, a steroid injection into the shoulder joint likely will be the next treatment option. These injections can ease pain and inflammation, and often effectively relieve discomfort caused by joint injuries. Because repeated steroid injections may lead to deterioration of the joint, however, there’s usually a limit on how often and how many of the shots you can get. In general, you shouldn’t get them more than two or three times a year. If none of the other approaches work to relieve symptoms of a rotator cuff tear, or if the tendon is completely separated from the bone, then surgery may be needed. The goal of surgery is to repair the damage by reattaching the tendon to the bone or, if the tendons cannot be repaired, proceeding with a shoulder replacement. In many cases, rotator cuff surgery can be performed using a minimally invasive approach that requires only small incisions. It often can be performed on an outpatient basis, so no hospital stay is necessary. The success rate for this surgery is quite high, with about 85 to 90 percent of patients receiving significant pain relief after surgery.